Here is a poster that can be found in a coffee shop on University of Chicago's campus. 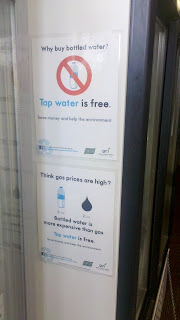 When I saw this poster, my first immediate thought was "There's no such thing as free tap water!" My second thought was "Gas would be more expensive if it had to be bottled for convenience." 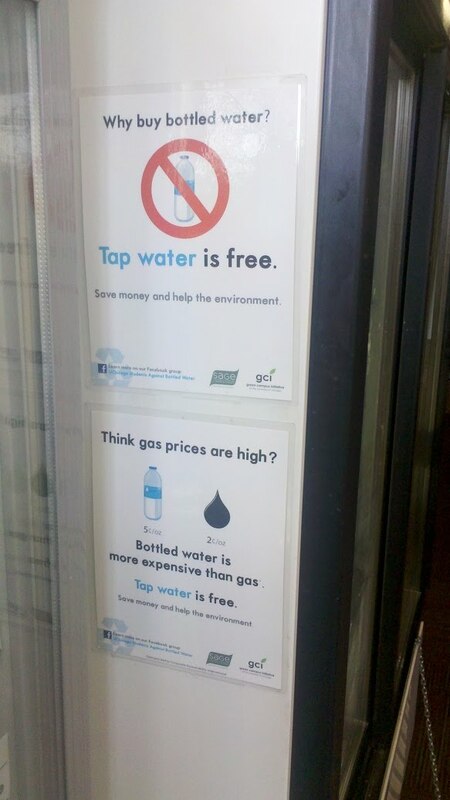 Nevertheless, the point about bottled water being bad for the environment is actually not too bad. But, I should qualify this statement because my reasoning has nothing to do with plastic bottles. The kind of bottled water that is especially bad for the environment is bottled spring water -- i.e., water from a natural spring that manufacturers put into a bottle. Once a bottling company finds a spring to harvest for its water, there are plenty of adverse consequences for the ecosystem surrounding that spring. The bottles may have adverse consequences, but my impression is that these pale in comparison to what happens to natural springs. The person who drove this idea home for me was law professor Robert Glennon, whose presentation on his water research transformed the way I think about bottled water whom I met at the Property and Environment Research Center. 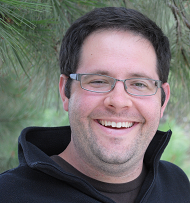 I was a graduate fellow, and he was a visiting scholar. I have since seen him on the Daily Show where he was marketing his book Unquenchable. Now, as I check his website, I see he is involved with a new documentary about water. Here's the trailer.